Mobile Design and Developmemt by Brian Fling is from O'Reilly (2009). This is a rich, deep look at mobile design. A multitude of devices and platforms defy standard answers to every mobile design and development situation, but Fling leads you though some steps meant to help you navigate those issues. The book first explains the mobile landscape and defines some of the needed terminology. A look at the scope of the mobile market gets a chapter. Fling devotes Chapter 4 to "Designing for Context." Context is an important concept he returns to in every chapter. He defines and redefines context throughout the book. In Chapter 4 he explains context as the way users will derive value from something they are currently doing. From this viewpoint, user context understands user circumstance. Context also means the environment in which a task is performed. These types of context include physical location, device, platform, access, media and the user's time and attention. Why will they use your app? How are they using their mobile device? Chapter 5 talks about developing a mobile strategy. He looks at reasons why some attempts fail while others succeed. The style of thinking that works in other forms of design and development don't work for mobile. He takes a look at thinking patterns and development decisions and makes many points about how to unleash the creativity needed to develop for the new world of mobile. The many types of mobile applications are explained in Chapter 6. In Chapter 7, he explains information architecture as it applies to mobile devices. In Chapter 8 he discusses the elements of design that apply to mobile. 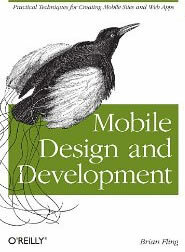 Anyone who is thinking of developing for mobile can benefit from this book. I think it would be especially valuable for businesses leaders who are successful in some area of technology and want to move into the mobile market. Thinking that worked in other situations doesn't help in mobile. The thinking patterns, development strategies, and new approaches needed for mobile development are well explained here. A person willing to make the changes needed will find excellent examples and strategies for change in this book. Summary: In-depth guide to mobile design and development concepts and techniques.